Possibly a rather risqué title bearing in mind my play on words name for this blog and the Oxford Dictionary definition (frankly amazed there is one) of bootylicious, but in reality it is intended to refer to the Monday offer of 50% off the price of “Pub Classics” on the menu at the newly done out Duke of Wellington pub in Cardiff City centre (known as – well by me – the Welly, hence the “boot(y)”). The other reason will become apparent as you read on (and, no, it is in no way salacious). I love a bargain (Mrs. SF may argue I am a bit of a miser) and food at 50% off to brighten up that otherwise generally depressing day that is Monday seemed too good to pass up on. Must say find it a tad unfair that in the blurb on the website one of the conditions of the offer (which is unrelated to booze) is you have to be at least 18. 16- 17 year olds can, in theory, go into a pub and buy food and non alcholic drinks legally, so seems bit ageist. Some arcane legal thing I am not aware of (not my area), no doubt. 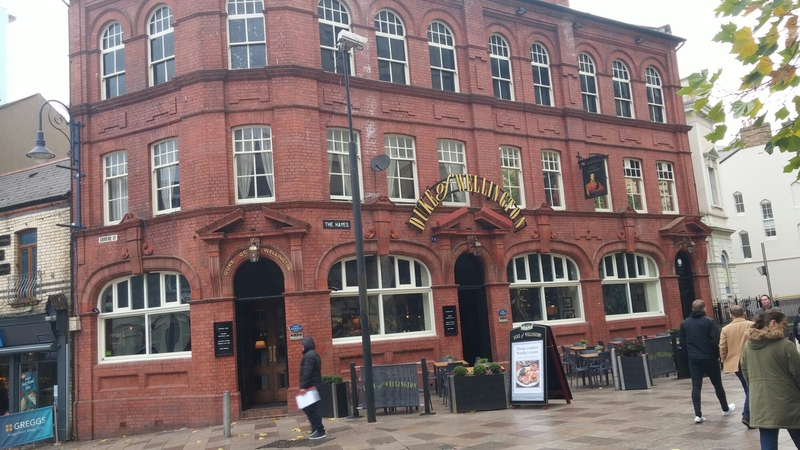 An SA Brains pub, on the outside I have always thought its red brick fascade rather lovely. 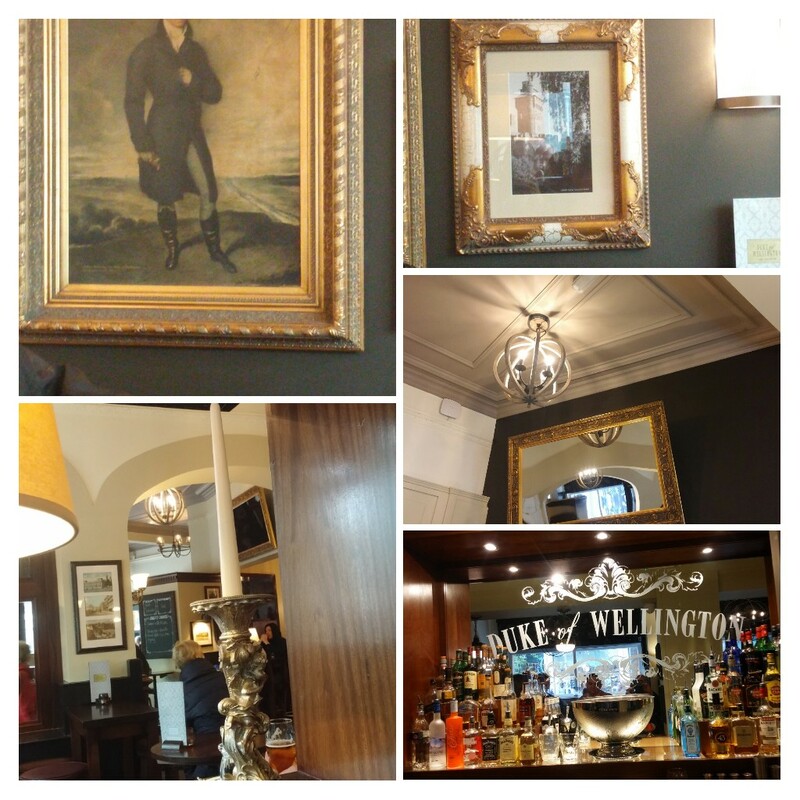 Inside prior to the recent refurbishment it had a bit of an old school drinkers feel to it and they don’t tend to worry overtly as to the niceties of decor (not that I do either), but the refurb. 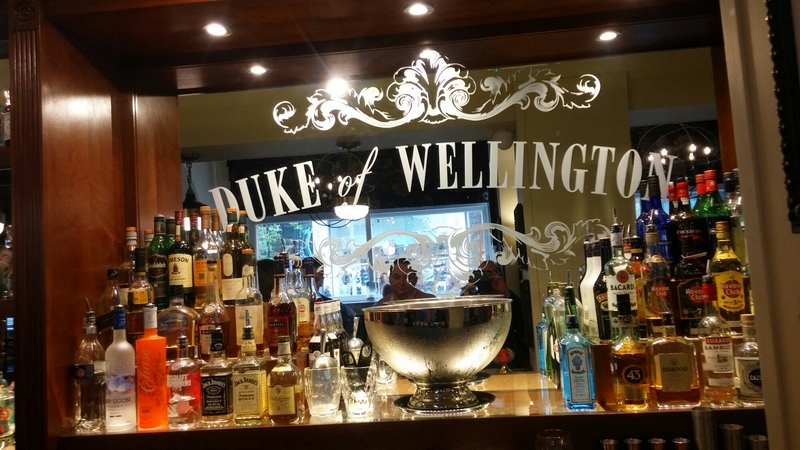 has certainly spruced up the place. 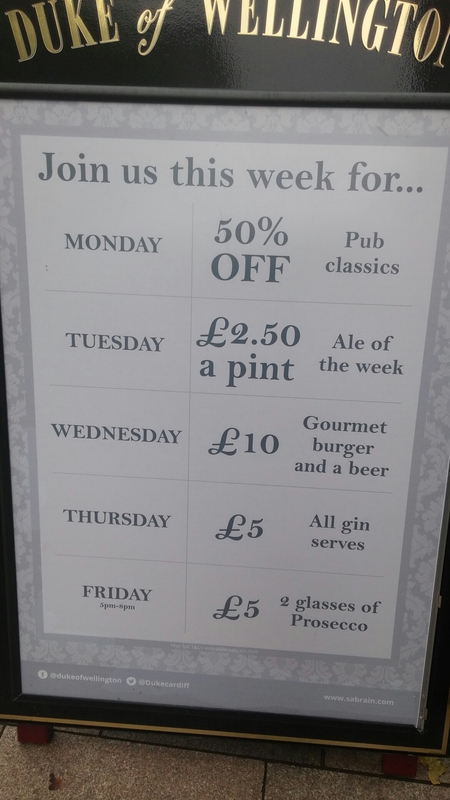 Whilst the menu covers a wide variety (arguably too wide- bit Jack of all trades) of things, the “50% off on Monday” offer relates only to the “Pub Classics”section. This contains the usual suspects, such as fish and chips, a pie, ham, egg and chips, scampi and chips etc. With prices ranging from £12.50 for steak and chips and £7.50 for sausage and mash (even without the discount) these look pretty reasonable. 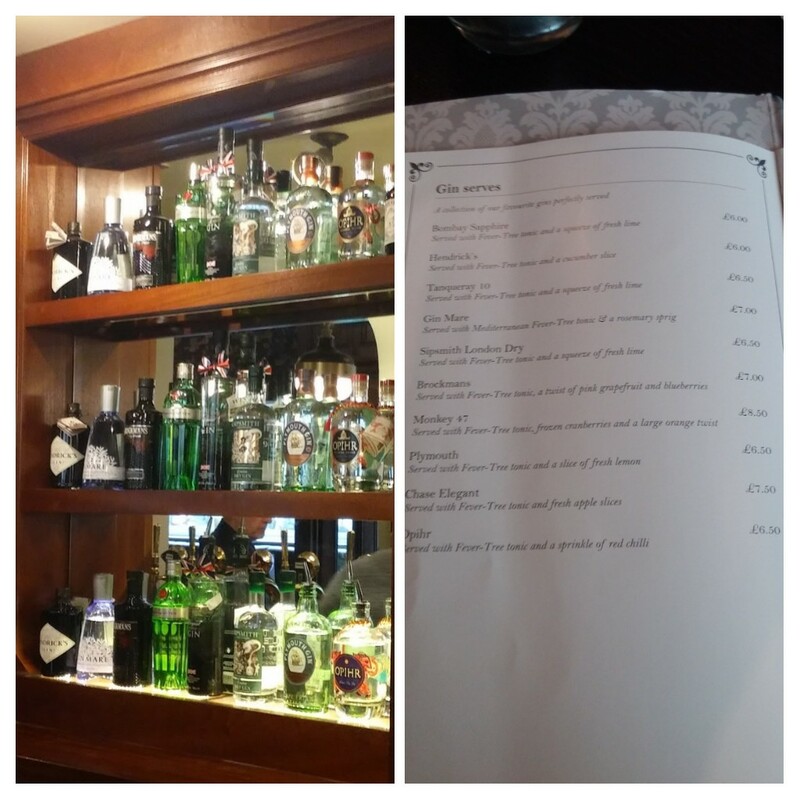 Other areas of the menu – particularly the “Welsh Classics” – also seem keenly priced. Cawl for £4.95 and Welsh rarebit (topped with a poached egg) for £3.95 look to be very good value, for instance. 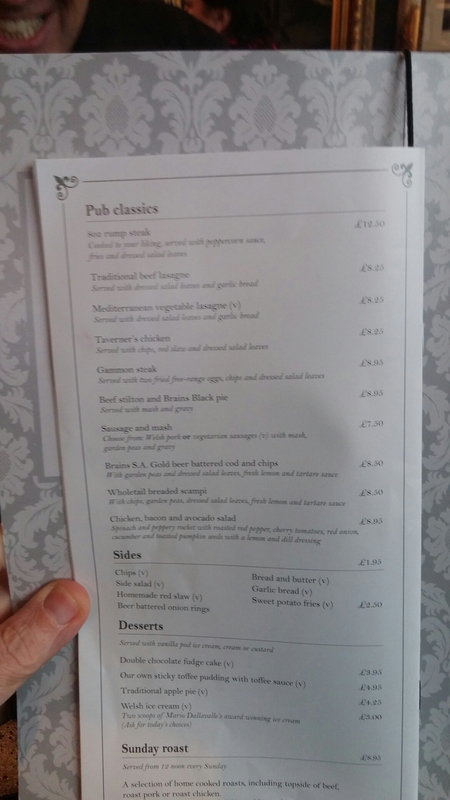 Based on the offer and our Monday lunch time visit, we went for the Pub Classics section and with the post title I was only going to ever go for one thing, a piece of “rump” steak. 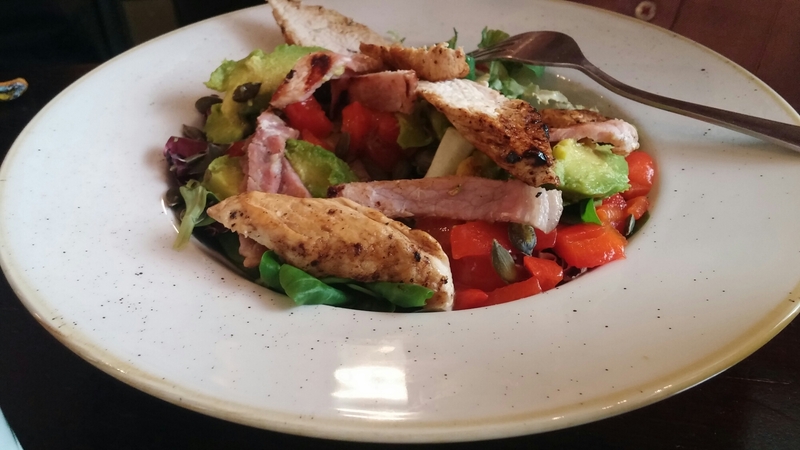 Coming in normally at £12.50 on the menu, the price on Mondays is reduced to a very satisfying £6.25 . Not bad from an 8oz rump steak and chips, if (and at that price it is a big if) the meat is decent quality. Whilst perhaps a bit out of fashion, sitting between the traditional premium cuts (boring fillet, sirloin, T- Bone etc) and the more trendy, cheaper (well they used to be) cuts (hanger, feather, bavette etc. ), I rather like a nice piece of rump steak. A decent piece of rump steak achieves to my mind a good balance between being reasonably tender and having lots of flavour. 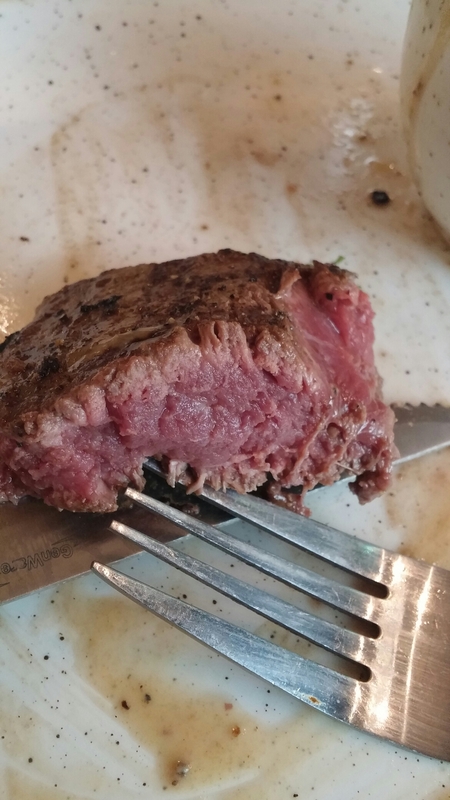 I ordered mine rare (in the anticipation it would probably arrive medium rare – I prefer my steak cooked under rather than over and this allowed a margin of error) . On arrival it was pretty much exactly as ordered. 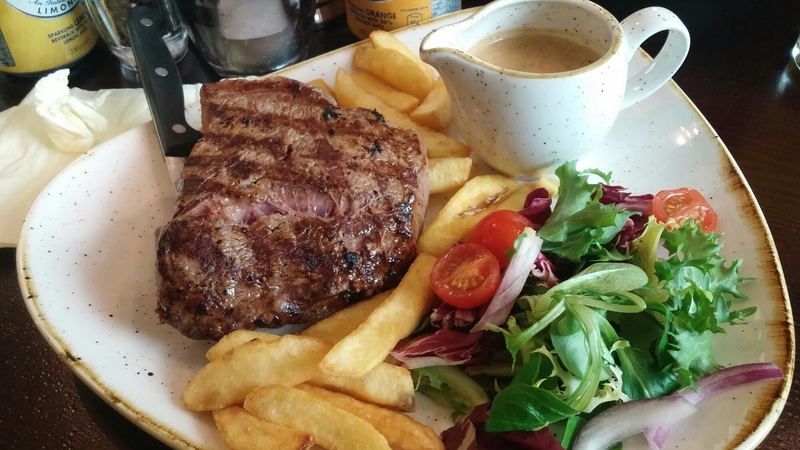 Whilst not perhaps the most flavoursome steak I have ever had (but better than Miller & Carter’s effort), it tasted fine and was reasonably tender. On the slightly negative side, the “cooked from frozen” chips were lacking crispiness and the portion was also a bit mean (at £6.25 I can forgive that, less so at the full price), the side salad was undressed (I hate that – especially as it was advertised as being dressed) and the peppercorn sauce was a tad on the weedy side (out of a jar or packet I suspect, but could be wrong). Whilst not without fault, I thought it would have been OK value at the full £12.50 price. As such, the Monday price of £6.25 was to my mind a bit of a bargain. I was quite happy. This was a big portion (seemingly no skimping on size here despite the offer), with a decent amount of nicely cooked chicken (not dry at all). This was more inventive than your standard chicken salad, with rocket, spinach, roasted peppers, pumpkin seeds and (so I was told) a not half bad lemon and dill dressing. Only bum notes were slightly flabby bacon (fat needed to be crisper) and use of somewhat overripe “past their best” avocados. For the Monday price of under £4.50, it was pronounced as more than acceptable. 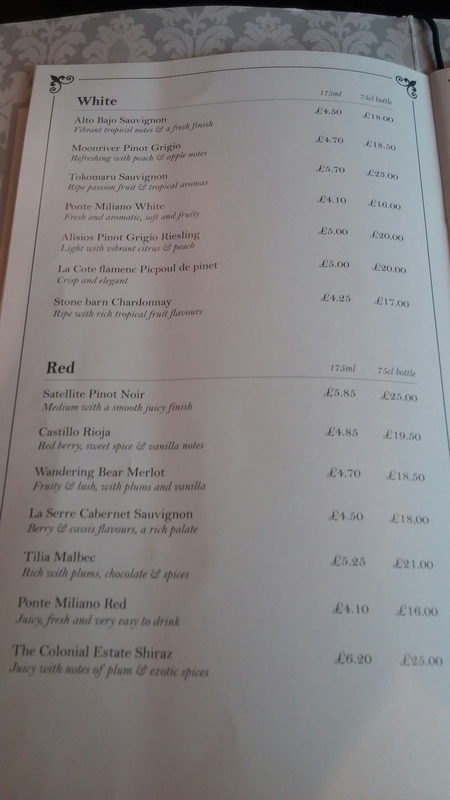 The wine list is short and a bit boring, but the pricing is not too horrific. The Tilla Malbec (£5.25 for a 175ml. glass and £21 a bottle as against around £8.25 retail) would have been a decent match for my rump steak. 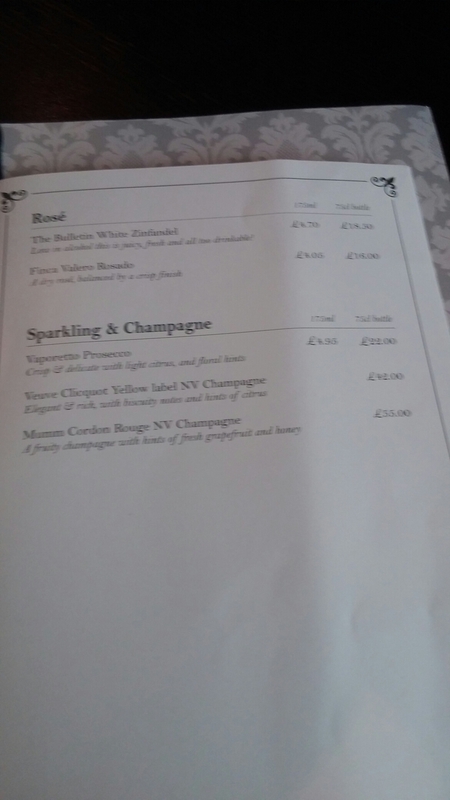 Rosés and the ubiquitous prosecco (as well as champers) are also available. 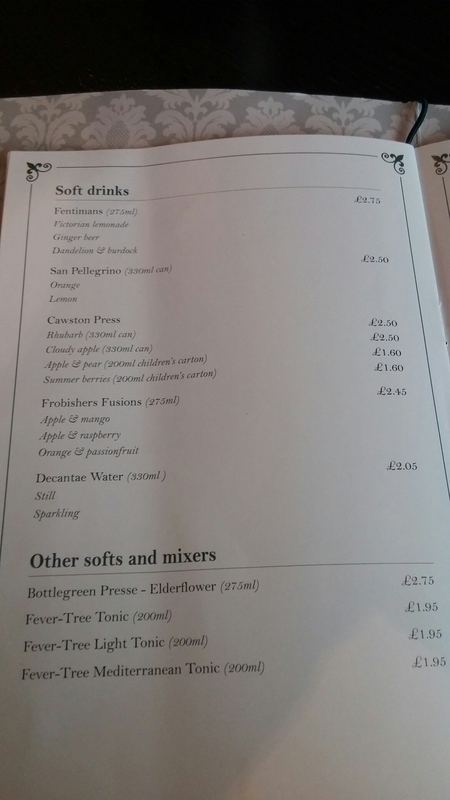 As it was a school day we were on the soft drinks and they have a fair selection on offer. 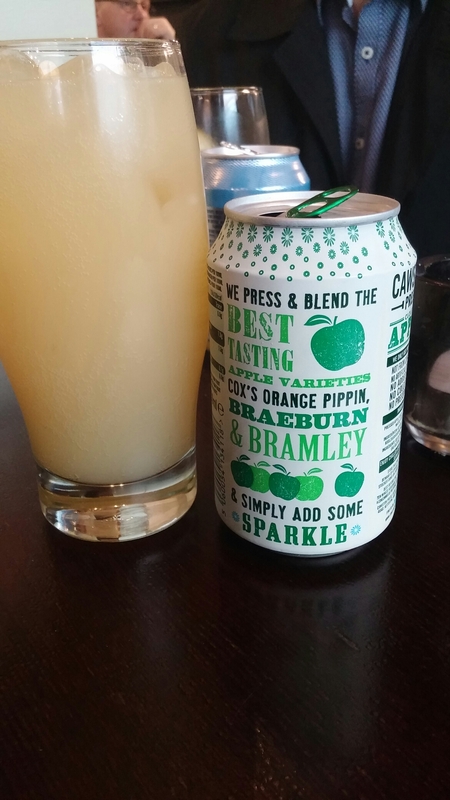 I went for a Cawston Press cloudy apple juice, which was £2.50 for a 33cl can (85p retail). Nice enough, if not particularly steak friendly. I have to admit I went more in hope than expectation and feared (bearing in mind the price) I would get a dinky, tasteless, overcooked steak. As it happened it wasn’t half bad and certainly good value for the reduced Monday offer price tag. I got over a quid in change from a tenner for a reasonable plate of steak and chips and a drink. I suspect we choose wisely as the person on the table next to us had the pie and she was far from happy from what I could tell (from my earwigging). From my view, whilst a decent sized pie, the pastry lid did looked very limp and soggy (so a soggy top rather than a soggy bottom- hah got it in again). Add to the mix some reasonably interesting stuff on the booze front and other week day offers (nice to see these extends to Fridays) and I think the Welly does offer a somewhat bootylicious bargin. Would I go back? Yes, I think I would. Was pleasantly surprised, if am honest. Address: 42 The Hayes, Cardiff, CF10 1AJ. 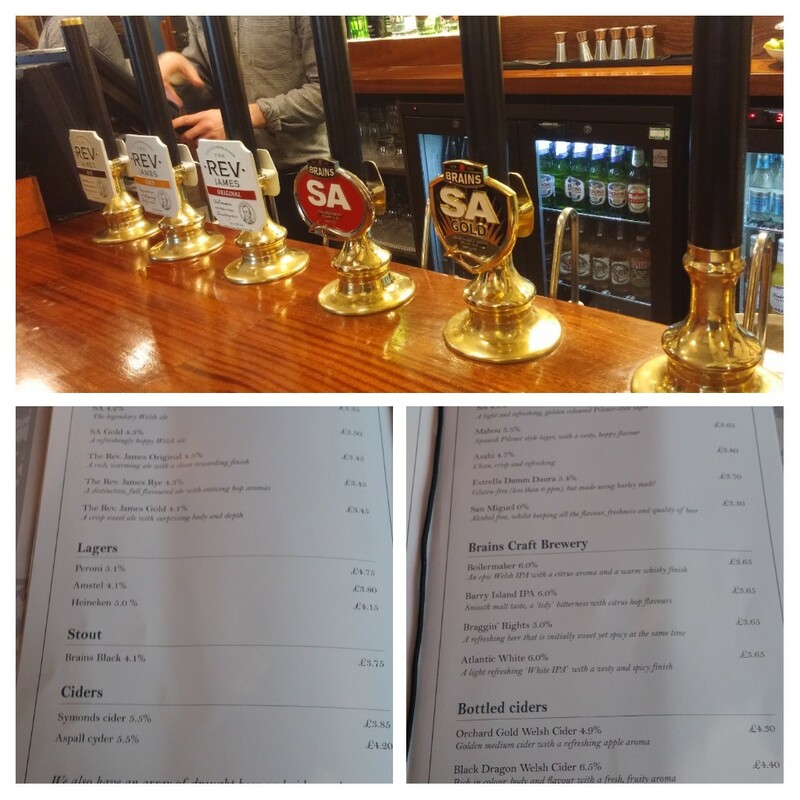 This entry was posted on Nov 20, 2016 by solicitingflavours in Bacon, Beer, bitter, Brains Brewery, Burger, Cardiff, craft beer, discount menu, Drink, Food, Food and wine products, lunch, lunchtime, Non alcoholic drink, Pie, Pies, Pub, pub lunch, Real ale, Red Wine, review, salad, steak, The Duke of Wellington, Wales, Welsh food, welsh rarebit, wine, wine mark up, wine pairing.